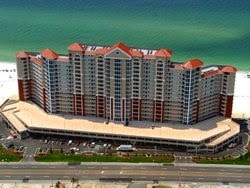 Lighthouse condominiums for sale in Gulf Shores, this popular beach resort is located on the Alabama Gulf Coast overlooking the beautiful emerald waters of the Gulf of Mexico. These beach accommodations have all the amenities for the perfect family vacation home or investment property. The amenities at Lighthouse Condos include multiple swimming pools, spacious condos, a fitness room, convenient to shopping, entertainment, nightlife, the BEACH, etc., etc. make a point to visit the Lighthouse in Gulf Shores Alabama, it's a great time to invest in beach real estate and to start enjoying the coastal lifestyle..